The Holy Land is a small yet diverse Middle Eastern country with a long coastline on the eastern Mediterranean Sea and a small window on the Red Sea at the Gulf of Eilat (Aqaba). It is bordered by Egypt to the southwest, by Jordan to the east, and by Syria and Lebanon to the north. It shares borders with Jordan at the Jordan River and the Dead Sea. The West Bank and the Gaza Strip have been under Israeli de-facto rule since 1967. In addition to the majority Palestinian Arab populations living in these regions, the Israeli Government has built many Israeli settlements in the West Bank as well as in the annexed Golan Heights. The three major monotheistic religions—Judaism, Christianity, and Islam—all have historical ties to the region. The Holy Land thus contains a vibrant modern history and culture, based in part on diversity. These aspects make the Holy Land a fascinating destination for many travellers and pilgrims. As a result of this vast blend of culture, in addition to the official languages of Hebrew and Arabic, Russian, French, Spanish, Amharic and Yiddish are also spoken by a significant minority of Israelis. English in many ways acts as second language. Within Israel’s recognized pre-1967 borders, about 80% of Israelis identify themselves as Jewish, the remainder classify themselves as either as Arab and/or Palestinian, Bedouin or Druze. The Holy Land is a highly urbanized and economically developed society and is therefore best divided for the traveller into its main cities and towns, followed by the regions and other sites. The voltage is 220 V, and the frequency is 50 Hz. The electric outlets used are type H and Type C. Type H is a uniquely Israeli three-pronged standard, but most modern type H outlets can also accept type C European two-pronged plugs. In fact, most electronic devices in the Holy Land use type C plugs. Electricity is supplied by the Israel Electric Corporation. The special phone number 103 can be used to reach the customer service center. Summer in the Holy Land is very hot, the coastal areas are humid as well as hot, and the landscapes are parched brown since it never rains in summer. The other three seasons, in contrast, have absolutely beautiful weather. In spring and autumn the temperature is near-perfect every day and nearly all days are sunny ,winter is a mixture of cold rainy days and cool, sunny days which are great for hiking and touring. So while summer may be the most convenient time to visit Holy Land, any other season is much more agreeable. The Holy Land possesses a number of diverse regions, with landscapes varying between coast, mountain, valley and desert landscapes, with just about everything in between. Beyond the towns and cities, each region of the Holy Land holds its own unique attractions. The metropolitan areas of Jerusalem and Tel Aviv form very much their own regions; from north to south. Although Jerusalem is known primarily for its religious significance, the city is also home to many artistic and cultural venues. The Israel Museum attracts nearly one million visitors a year, approximately one-third of them tourists. The 20-acre (81,000 m2) museum complex comprises several buildings featuring special exhibits and extensive collections of Judaica, archaeological findings, and Israeli and European art. The Dead Sea scrolls, discovered in the mid-20th century in the Qumran Caves near the Dead Sea, are housed in the Museum’s Shrine of the Book. Next to the Israel Museum is the Bible Lands Museum, near The National Campus for the Archaeology of Israel, which includes the Israel Antiquities Authority offices. A World Bible Center is planned to be built adjacent to Mount Zion at a site called the “Bible Hill”. A planned World Kabbalah Center is to be located on the nearby promenade, overlooking the Old City. The national cemetery of Israel is located at the city’s western edge, near the Jerusalem Forest on Mount Herzl. The western extension of Mount Herzl is the Mount of Remembrance, where the main Holocaust museum of Israel is located. Yad Vashem, Israel’s national memorial to the victims of the Holocaust, houses the world’s largest library of Holocaust-related information. It houses an estimated 100,000 books and articles. The complex contains a state-of-the-art museum that explores the genocide of the Jews through exhibits that focus on the personal stories of individuals and families killed in the Holocaust. An art gallery featuring the work of artists who perished is also present. Further, Yad Vashem commemorates the 1.5 million Jewish children murdered by the Nazis, and honors the Righteous among the Nations. The Museum on the Seam, which explores issues of coexistence through art, is situated on the road dividing eastern and western Jerusalem. The Jerusalem Symphony Orchestra, established in the 1940s, has appeared around the world. The International Convention Center (Binyanei HaUma) near the entrance to city houses the Israel Philharmonic Orchestra. The Jerusalem Cinemateque, the Gerard Behar Center (formerly Beit Ha’Am) in downtown Jerusalem, the Jerusalem Music Center in Yemin Moshe, and the Targ Music Center in Ein Kerem also present the arts. The Israel Festival, featuring indoor and outdoor performances by local and international singers, concerts, plays, and street theater has been held annually since 1961, and Jerusalem has been the major organizer of this event. The Jerusalem Theater in the Talbiya neighborhood hosts over 150 concerts a year, as well as theater and dance companies and performing artists from overseas. The Khan Theater, located in a caravanserai opposite the old Jerusalem train station, is the city’s only repertoire theater. The station itself has become a venue for cultural events in recent years as the site of Shav’ua Hasefer (an annual week-long book fair) and outdoor music performances. The Jerusalem Film Festival is held annually, screening Israeli and international films. The Jerusalem Biblical Zoo has ranked consistently as Israel’s top tourist attraction for Israelis. In 2006, a 38 km (24 mi) Jerusalem Trail was opened, a hiking trail that goes to many cultural sites and national parks in and around Jerusalem. Jerusalem is the state broadcasting center of Israel. The Israel Broadcasting Authority’s main office is located in Jerusalem, as well as the TV and radio studios for Israel Radio, Channel 2, Channel 10, and part of the radio studios of BBC News. The Jerusalem Post and The Times of Israel are also headquartered in Jerusalem. Local newspapers include Kol Ha’Ir and The Jerusalem Times. God TV, an international Christian television network is also based in the city. The Jerusalem Central Bus Station, located on Jaffa Road, is the busiest bus station in Israel. It is served by Egged Bus Cooperative, which is the second-largest bus company in the world, The Dan serves the Bnei Brak-Jerusalem route along with Egged, and Superbus serves the routes between Jerusalem, Modi’in Illit, and Modi’in-Maccabim-Re’ut. The companies operate from Jerusalem Central Bus Station. Arab neighborhoods in East Jerusalem and routes between Jerusalem and locations in the West Bank are served by the East Jerusalem Central Bus Station, a transportation hub located near the Old City’s Damascus Gate. The Jerusalem Light Rail initiated service in August 2011. According to plans, the first rail line will be capable of transporting an estimated 200,000 people daily, and has 23 stops. The route is from Pisgat Ze’ev in the north via the Old City and city center to Mt. Herzl in the south. Another work in progress is a new high-speed rail line from Tel Aviv to Jerusalem, which is scheduled to be completed in 2017. Its terminus will be a new underground station (80 m (262.47 ft) deep) serving the International Convention Center and the Central Bus Station, and is planned to be extended eventually to Malha station. Israel Railways operates train services to Malha train station from Tel Aviv via Beit Shemesh. Begin Expressway is one of Jerusalem’s major north-south thoroughfares; it runs on the western side of the city, merging in the north with Route 443, which continues toward Tel Aviv. Route 60 runs through the center of the city near the Green Line between East and West Jerusalem. Construction is progressing on parts of a 35-kilometer (22 mi) ring roadaround the city, fostering faster connection between the suburbs. The eastern half of the project was conceptualized decades ago, but reaction to the proposed highway is still mixed. There is two major International Airports which are Tel Aviv – Ben Gurion Airport and Eilat ramon airport. And Three Minor International airports which are Eilat-Uvda airport, Eilat-J. Hozman airport and Haifa-U. Michaeli. In addition to domestic/ private air ports. Ben Gurion Airport, named after David Ben Gurion, is Israel’s main airport. It is located at the heart of the country, around 40 km from Jerusalem and 15 km from Tel Aviv. The Airport has its origins in the 1930’s. The Israel Airports Authority was established in the late 1970’s as a statutory corporation, and the airport has evolved and prospered ever since, with passenger and air traffic figures constantly rising. In the 1990’s the IAA recognized the fact that the old Terminal 1 was no longer capable of handling the increasing passenger traffic, and a joint decision was made with the Minister of Transport to build a new terminal with higher capacity – Terminal 3. The Airport is Israel’s gateway, and as such it serves its citizens who fly all over the world, as well as foreigners who visit the country. The Airport has two main terminals: Terminal 3 for international flights and Terminal 1 for domestic and low-cost international flights. Ben Gurion Airport is a modern airport, equipped with state-of-the-art technological installations and operational facilities that meet international standards. The Airport is accessible to disabled passengers and provides passenger service and special VIP services at the highest level. The safety and security measures implemented at the Airport meet the highest global standards and air traffic safety is top priority. The Distance between Ben Gurion airport to Jerusalem is 54 km and takes around 59 minutes to arrive to Jerusalem. At Ben Gurion Airport take a shuttle from your terminal to the Ben Gurion Airport El Al Junction. Egged bus 947 leaves the junction approximately every 20 minutes for the Jerusalem Central Bus Station, starting at 6:17 a.m. through 22:22. Going to Jerusalem takes about 1 hour and 10 minutes. You can hail a taxi at the official taxi stand outside the arrival hall, or call a cab company. If you have lots of luggage, or more than four people in your party, ask for a large vehicle. By law a regular taxi can only take four passengers. Average cost to/from Jerusalem should be around 180 shekels, perhaps a bit more if you have more than two passengers or lots of luggage. The train between Jerusalem and Tel Aviv is a relatively new institution – only a few years old. Israelis don’t seem to have got used to the idea yet, which means the trains are usually not so crowded. They’re clean, comfortable and run on time. Once you pass the city of Beit Shemesh, the tracks wind through the mountains and you may spot deer as you go through the forest. It’s a pleasant way to travel. Going to Jerusalem by train – or taking it from Jerusalem to Tel Aviv – for a day trip is a fun way to travel with the kids. But we don’t recommend it when you’ve just landed at the airport after a long flight! From the Airport, the train leaves approximately every 2 hours. Get off at the Tel Aviv HaHagana station, and wait on the same platform for the train to Jerusalem. The train makes two stops in Jerusalem – the first is the zoo. Stay until the end of the line at the Jerusalem Train Station (Malha). The train station is on the outskirt of town. You’ll have to pick up a cab to get to your hotel. The trip takes between 1:40 and 2:30 hours, depending on the number of stops. The Holy land is a land that offers a plethora of historical and religious sites, apart from the regular beach resorts and ecotourism that most people prefer. Israel, with its archaeological and heritage sites, has on offer, everything a tourist would want. There’s history and geography, along with philosophy and religion, and there’s also culture and tradition, not to forget Israeli cuisine. You would benefit if you kept aside the Israel-Palestinian conflict while planning a trip to this country that is gaining significance for religious tourism. In recent years, Israel has seen a steady influx of tourists from all over the world, thanks to the overwhelming response to the Holy Land packages that are on offer. Places like Jerusalem, Nazareth, and Caesarea, have turned into tourist hotspots in the recent past. There is lots to do, learn, and take back with you from a trip to Israel, and I am sure no one would like to just sit back and relax. Let’s make a quick tour of this little country. Located outside the walls of the Old City of Jerusalem lies the Garden Tomb on which Jesus’ tomb lies. The rock-cut tomb, which is adjacent to Skull Hill or Calvary, is an integral part of the Holy Land Tour taken up by Christians the world over. Regarded to be the most important Christian site in Jerusalem, the Church of the Holy Sepulchre is believed to be the place where Jesus was crucified. The church forms the 14th post on the Via Dolorosa, and is lined with many smaller chapels belonging exclusively to specific denominations. Located at the northwest corner of the Old City, the Tower of David contains important archaeological finds, dating back 2,700 years. It houses the Tower of David Museum, opened in 1989. You can even ascend to the rampart and enjoy a 360° view of Jerusalem. The Western Wall or the Wailing Wall is located at the foot of the western side of the Temple Mount. Considered to be the closest permitted accessible site to the holiest spot in Judaism, it is venerated as a pilgrimage site by the Jews. Located on the Temple Mount in the old City of Jerusalem is the Dome of the Rock, also known as Qubbat As-Sakhrah. The Muslims believe it to be the site of the Islamic miracle of the Isra and Miraj. Patterned after the Church of the Holy Sepulcher, the Dome of the Rock is supposed to be the first great work of Islamic architecture. The Foundation Stone has its significance for the Jews, Christians, and Muslims. Located on the eastern slopes of Jerusalem’s mountains, and running adjacent to the Old City, is Mount of Olives. Used as a Jewish burial site, it houses an estimated 150,000 graves on the mount. At the foot of the mount lies the Garden of Gethsemane, featuring trees that are over 2,000 years old. Located in the Kidron Valley on the eastern side of the Old City of Jerusalem is the tomb of Zechariah. It is a square monolith with a three-stepped base. The valley also contains the tombs of Absalom, Jehoshaphat, and Benei Hezir. The Old City of Acre is situated in the Western Galilee region of northern Israel. Acre is a historic walled port-city that has been continuously inhabited. The remains of the town have been intact, both above and below the ground, making it a UNESCO World Heritage Site. In the Old City of Acre is the Khán-i-‘Avámid or the Khan al-Umdan, an important trading spot since the Ottoman period. A major tourist attraction that is open all hours of the day, it has been converted into an open-air stage, to house the theater festival in the month of October. Galilee is a large region in northern Israel, and is associated for the serene mountain scenery and the Sea of Galilee. Inextricably linked with the life of Jesus Christ, it is also home to two of Judaism’s holy cities. Galilee is a popular tourist destination, especially among Christians, as many of the miracles of Jesus occurred here. Safed is the highest city in Galilee and Israel, and is considered to be one of the Four Holy Cities of Judaism. It is a center of the Kabbalah, or Jewish mysticism, and is frequented by both Israelis and foreign visitors alike. Lake Kinneret or the Sea of Galilee, as it is known, is the largest freshwater lake in Israel. Christ’s sermon on the mount, calming the storm, and walking on water, are said to have been performed at this site. The mountain is known for being the site of Jesus’ famed sermon. Its unique combination of high and low altitudes, and a plateau-like valley, serves as a natural amphitheater that could easily accommodate the multitude that came to hear the sermon. Located on the northwestern shore of the Sea of Galilee is the church that commemorates Jesus’ feeding of the ‘Five Thousand’. It also holds the remains of a fifth-century church that stood in this place. Built on the peak of Mount Tabor in Lower Galilee is the Church of the Transfiguration. Supposed to be the place where the famed Transfiguration of Christ took place, Mount of Tabor also houses an Orthodox church, and a cave on the northwestern side. This place is said to be where the seed of Christianity was planted, and is supposedly the largest Christian sanctuary in the Middle East. Located along the Jordan in the Galilee region of northern Israel is the Yardenit Baptismal Site, which is frequented by Christians. This site sees an average of 400,000 visitors each year. Located on the western shore of the Sea of Galilee is one of the Four Holy Cities of Judaism. Visit the Hammat Tiberias Synagogue, a 4th century synagogue which contains the Torah shrine. Tiberias is supposedly the final resting place of many prominent Jewish rabbis and thinkers. Visit the 2,000-year-old Roman theater that was unearthed near Mount Bernike in the Tiberias hills. Brimming with history, this place attracts scores of travelers each year. 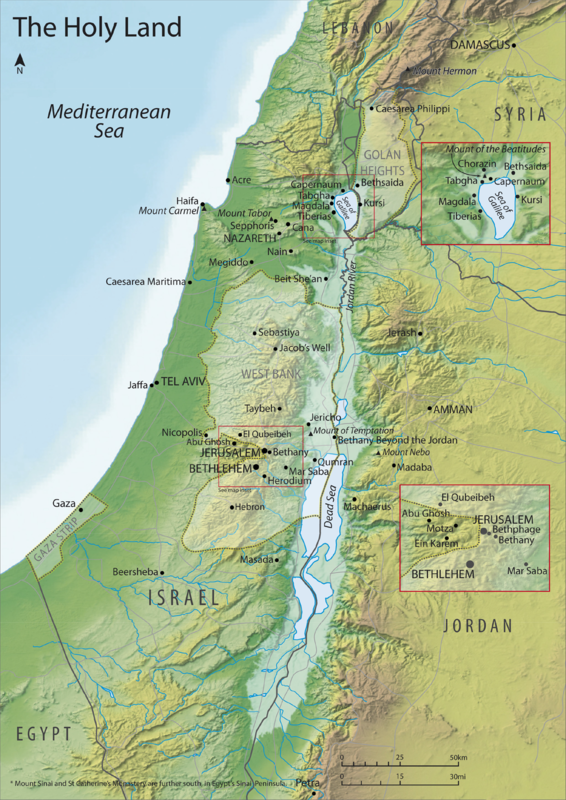 The largest city in northern Israel is located on the northern slope of Mount Carmel. Haifa is home to the Bahá’í World Center, and Matam, one of the oldest and largest high-tech parks in the country. A major seaport located on the Mediterranean coast, it is the major regional center of northern Israel. Located in Haifa, the Bahá’í World Center comprises the Shrines of Bahá’u’lláh, Báb, and `Abdu’l-Bahá, other holy sites of the Bahá’í Faith in the area, and the buildings on the slope of Mt. Carmel. Located near the city of Hadera is the town of Caesarea. The town served as a major social, political, and commercial center for the Romans. It is an extensive archaeological site visited by many tourists yearly. Visit the Caesarea National Park that preserves the Roman aqueduct, and standing Crusader balustrades and towers. The Roman theater hosts concerts, entertainment extravaganzas, and the annual Caesarea Jazz and Opera festival. Tel Aviv is the largest metropolitan area in Israel, and its second most populous city. Founded on the outskirts of the ancient port of Jaffa by the Jewish community, it is one of the tourist hotspots in Israel. Located on the eastern edge of the Judean desert and overlooking the Dead Sea, Masada is Israel’s most popular paid tourist attraction. The ancient fortress is popular for its unique geographical formation, and for the exhilarating hike that it provides. The Dead Sea that lies in the Jordan Rift Valley, has attracted visitors from around the world for centuries. A visit to the Dead Sea is a must for a therapeutic experience. Go scuba diving, and indulge in other water sports at Eilat. Explore the coral reefs, and visit the maritime museum at Eilat, to complete an adventurous holiday in Israel. That pretty much sums up a tour of Israel. Most of the places are tourist hotspots, due to the emergence of Holy Land tours that are conducted the world over. Make the most of your trip to this land of the world’s largest religions.